I just listened to a most electrifying teaching by Laura Densmore that rethinks the traditional interpretation of Daniel 9:24. There is a high, very high probability that Christendom’s interpretation has been wrong. Laura brings together pieces of Dan Bruce’s recent book, Daniel Unsealed, as well as history and Scripture to present a compelling case for understanding that we are in the 69th week of a third fulfillment of Daniel’s Seventy Week Prophecy. Presented in the two part video and slide series below, Laura explains that the seventy weeks that Hal Lindsey of Late Great Planet Earth fame declares to be weeks of years (i.e., 7×70=490) is actually seventy Shavuot, or seventy feast cycles. In other words, 70 weeks (shavua) is 70 Feast cycles (years) from the decree… Charts and historical fulfillment at the time of Yeshua match exactly. The BIG question is her postulation that 70 years from the November 1947 decree to reestablish the secular state of Israel is next fall. Therefore, if her postulation is correct, we are at the very end of the 69th year (Feast cycle) right NOW. 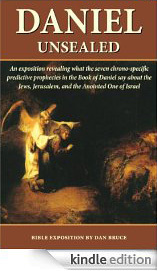 Ironically, when Daniel received this prophecy, he was in the 69th year of the 70 year exile of Judah to Babylon. Is this information being unfolded before us in the current 69th year? Here is the pdf to go with Laura’s videos, however, her new updated video split into two parts has new slides that are much easier to see in the YouTube viewer. Laura is not alone in her conclusions. Arriving at the same point in time, albeit by slightly different directions, Greg Raley and Steve Moutria have each independently been asking similar questions. Both have been guests on The Remnant Road, a Monday morning show on Hebrew Nation Radio. In fact, Steve will be on the show tomorrow morning to cover more of this material, among other things. Friend and co-host of The Remnant Road, Al McCarn, forwarded me the link of the now archived show. If these ‘Daniels’ are right in their hearing, and if the book is being unsealed in this time, then the midpoint of the 70th shavua is right after Pesach 2017, meaning the Second Exodus may be a short seven or eight months away!! WOW!! World events certainly seem primed for the acts of God that would be involved in bringing us out… Fascinating. Please watch/read and process the information collected in this post and comment/discuss. VERY interesting days we are living in. Whether Laura is right or not remains to be seen, but her action points are an absolute MUST, regardless of the preceding information. This entry was posted in A Thought... and tagged antichrist, Feast of Weks, Messiah, prophecy, Second Coming, shavuot. Bookmark the permalink. No doubt about it ,times are on the horizon.70 yrs are up,this generation Shall not pass.My vision of Rev.1;7 in 1997, my visitation in 2007.2017 has something heavy on my spirit for the world..I pray ..Gary R..
Thankyou for publicizing the teaching! I actually RE- Recorded it, broke it out into Part 1 and Part 2, added a couple of new slides and concepts and the quality of the slides is much much better. Am in the process of uploading right now. awesome.. so the 70 year is the period of time until one goes back? like you have 70 years left from a specific date. will watch part two now. Hi, i just so happen to be re-studying dani’el which began in July and we are on the 9th chapter. this post came across my facebook page today. so surreal. Be prepare on April – May 2017. Start backpacking.